Recommended dosage: One teaspoon, twice a day. Main herbs used in the production of ClearMel: Sambucus nigra (elderberry), Polygonum aviculare (knotgrass), Pinus sylvestris (Scots pine), Plantago major (plantain), Portulaca oleracea (purslane). 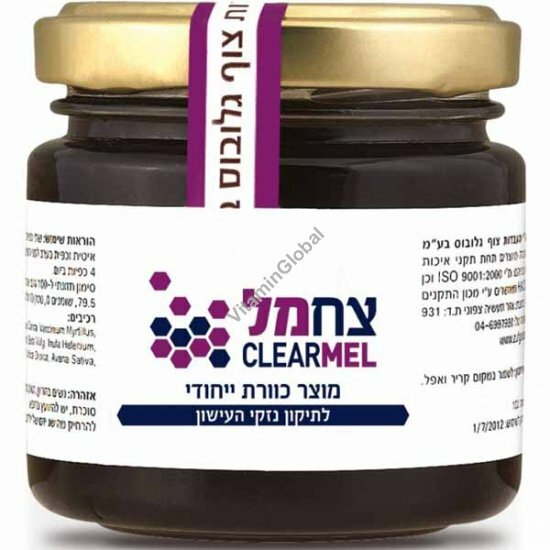 ClearMel customers, please note that in rare cases you may receive one or more bottles with a small amount of honey leaking from the area of the seal around the cover. If this should happen, there is absolutely no problem. This phenomenon can happen because Life Mel is not vacuum packed, such that air pressure changes during international flights can force out a bit of honey, especially if a jar has more than the listed 120 grams. Being a natural antibiotic, there is no chance of the honey turning rancid, in or out of the bottle. Simply clean up the jar and use as per the directions. To be clear, there are no refunds or compensation for such minor leakage. Manufactured by: Zuf Globus Laboratories Ltd.